We’re thrilled to announce the launch of this rich resource, which captures all the elements of Rainbow Plate’s joyful, evidence-based approach and programs. This high-quality binder is packed with 120 pages of information, ideas, creative resources, practical tips and simple, hands-on activities to enable you to bring food literacy education to life in any early years setting! • Learn to use all their senses to explore and experience a variety of different fruits and vegetables. • Learn to use positive and creative language to describe foods. • Enjoy discovering the wonderful sensory properties of different fruits and vegetables. • Gain repeated exposure to a variety of fresh fruits and vegetables in a positive and pressure-free way - a strategy that has been proven to increase their willingness to eat these foods in the future! • Learn about the ways in which food connects different aspects of the world around them, so that they can become ambassadors for a healthy and sustainable future. This toolkit has been designed like a “pantry” of ingredients that you can draw from, to create your ideal “recipe” for success. You can use it in the way that best suits your unique setting, and the ages, cultural background, needs and interests of your children and your community. • The Rainbow Plate Approach - a peek into our colourful world and the principles behind our innovative approach to food education. • Sensory-Based Food Education in the Early Years: What the Research Says - a summary and some academic references highlighting the evidence behind this approach and program. • A Mindful Approach Towards Food - our philosophy regarding the use of food in the classroom, food insecurity and food waste. • Food Safety and Practical Tips - information about classroom set up, food preparation, safety and other considerations. • Introducing the Rainbow Food Explorer Concept and Program - some creative ideas to support you in introducing the concepts to children and creating a Rainbow Food Explorer environment in your setting. • Tips for Promoting Positive Food Experiences - practical tips and techniques to help keep adult interactions with children positive and pressure-free. • Parent & Caregiver Resources - templates that you can customize, copy and share, to make it easy for you to connect with and engage parents, caregivers and community members. or vegetable, sorted into two categories: exploring the whole fruit or vegetable and taking it apart. Fun Facts - a few interesting tidbits of information about each fruit or vegetable! 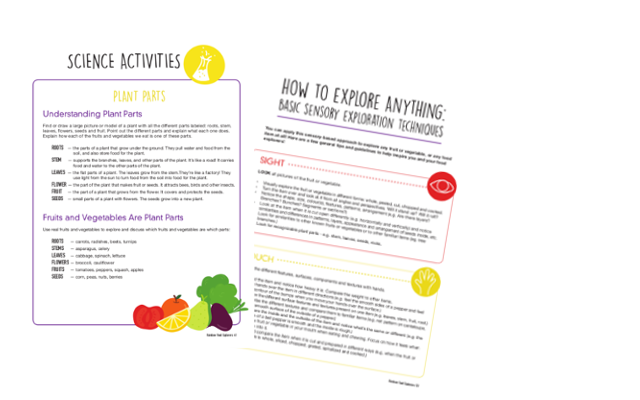 Extend the Exploration - suggested activities that are unique to that fruit or vegetable. They’re different on each card and typically fall into one or more of the cross-curricular categories. Here you’ll find lots of ideas for using fruits and vegetables throughout all areas of your curriculum. *Canadian orders can be processed simply by clicking the “Buy Now” button above. If you’re outside Canada please email us at hello@rainbowplate.com and we’ll be happy to help you!